There’s an old saying that you have to have money to make money. Jason Hartman has proved that wrong with his podcasts and educational events, such as the upcoming Meet the Masters of Income Property Investment. This amazing opportunity allows you to learn about real estate investments which require little up-front financial commitment, yet can potentially produce amazing returns. In fact, most wealthy people became that way through real estate investment, and so can you. This two-day class will teach you the keys to successful property investments, including skills and techniques to properly analyze properties, acquire the ones with most potential, manage your existing properties, and preserve your wealth. Once you begin the path to financial independence, you’ll have more time to concentrate on your survival plan for TEOTWAWKI. One item that you’ll want to include in your arsenal of plants is aloe vera. They are hardy, easy-to-keep plants that are incredibly versatile. 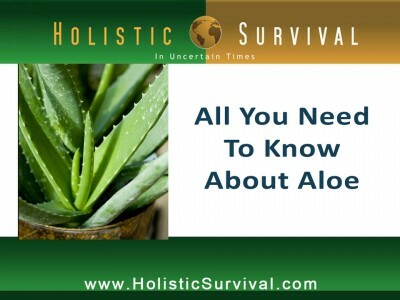 The most common external uses of aloe arise from utilizing the medicinal properties of its gel-filled leaves. Simply break a leaf off, and rub the gel on the skin to soothe burns and even cure them. Aloe can ease itchy skin caused by dry skin, eczema, insect bites, poison ivy or oak, and even psoriasis. It works against fungal and bacterial infections and relieves hemorrhoid pain. It helps ease pain associated with both burns and superficial cuts, as well as actually promoting healing. Some people also recommend consuming the aloe vera plant to cure internal medical issues. A teaspoon of gel can soothe stomach irritation and even help with ulcer pain. Pregnant women should not eat any part of the plant, as consuming it has been associated with miscarriages and birth defects. The outer part of the leaf can be ground and mixed with a liquid to help with constipation, although it can cause severe cramping, so other options should be attempted first. Additionally, the body builds up a tolerance, as with all laxatives, and other dangers are possible, including dehydration and even kidney failure. Before considering consuming the waxy portion of the leave, be warned that tests show that this may be linked to cancer in rats, although no testing on humans have been made. Consuming the gel has been known to lower blood pressure, but it should never be used in conjunction with diabetes medicine, which may cause your sugar to drop too low. Repeated consumption of the latex extract that is in the inner skin of the plant leaf has been documented as the cause of death in more than one instance. Only consume the aloe vera plant if you are in a dire situation or are extremely knowledgeable. Also, always consult your doctor before making any replacements to your usual health routine.